Our parish consists of the village of Water Stratford, the hamlet of Bufflers Holt and some outlying farms – about fifty dwellings in all. The village is bounded on the south-west and south-east by the River Great Ouse and mostly lies on a Roman road. Thus its name simply derives from where this road or strat forded the river, with 'Water' perhaps being added to distinguish it from Stony Stratford, about twelve miles to the east, to which it may have been connected by another Roman road. Its earlier name seems to have been West Stratford, which reinforces this idea of a relationship with Stony Stratford. While the village's existence goes back at least to Roman times, its written history starts with the Domesday Book. The Norman Conquest brought ownership of the main manor into a system of lords, overlords, fiefdoms and demesnes that one needs to be a lawyer, preferably a medieval one, to understand fully! Other land was in the possession of various religious institutions. Between 1553 and 1919 the manor was owned by just three different families, changing hands in 1698 and around 1760, though the name of the owners changed more often as the inheritance passed through daughters. The most interesting names in terms of village history are the first and last: the Frankish family built The Manor and played a prominent part both in the village and the county, and the Parker family created the pattern of ownership we see today when on 12th July 1919 the estate was auctioned in separate lots at the Swan and Castle Hotel in Buckingham and several tenant farmers and others took the opportunity to buy their freehold. In 2007 a historical society formed in the village and various people undertook research on local buildings and families. Their work is being collated and is gradually being published on this site, much of it on the Buildings: past and present page. Neighbouring places such as Bicester, Tingewick and Finmere have also produced local history sites. The church is an important focus of community life, as we have no school, shop or pub in the village, though there is a pub, The Robin Hood, in the parish at Bufflers Holt on the A422 Buckingham to Brackley road. The Old School serves as a village hall and is the venue for many of the events held to provide entertainment, promote community spirit, and raise funds to maintain the church and continue its ministry. These are run by either the Parochial Church Council, or our Parish Meeting (a type of parish council designed for very small villages), or both. Our MP is the Speaker of the House of Commons, Rt Hon John Bercow, and local government is via Aylesbury Vale District Council (AVDC), and Buckinghamshire County Council (BCC). Links to useful services, such as refuse collection and potholes, are being grouped on a separate page. Rector for the last four years of his life and was buried here; Charles McArthur (1826-97) was the father-in-law of Louis Ernest Goddard, our Rector from 1888 to 1921; Gerald Dickson (1898-1984) lived in The Old Rectory briefly before his death and was buried here. This painting, entitled Water Stratford Gateway, is a limited edition print by Jane Scott which is one of a series of eight local scenes. They are available to purchase from the artist or from Buckingham Garden Centre, where some are on exhibition in the restaurant. The logo for this website is a detail from Jane's painting of the church door. 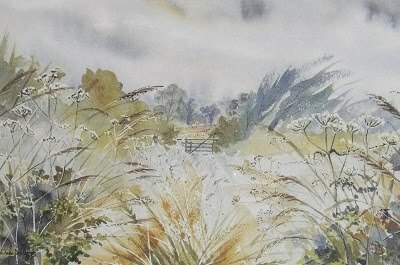 The framed water-colour of the church in 1991 shown on the church page is also presumed to be by a local artist but we have been unable to identify who it was. Several writers have lived here. Abel Kidd wrote verses about this area in the 1870s and was buried here. Dorothy Fells was a freelance journalist and broadcaster who lived in the village in the 1940s and 1950s. Her husband's work took her to New Zealand in the 1960s, where she broadcast children's stories based on legends in many lands. In 1965 these stories were published as a book called A Tale to Tell. Christopher Hilsdon, a local farmer, published a collection of his rural writings in 2010 under the title Seasons under my Sky and extracts from it are shown here. It is available from the author at £6.99 and includes poetry, prose and illustrations. He has also written a poem in memory of his great uncle who was killed in WWI. Sara Edwards wrote a collect for John Mason in 2008 and a hymn for St Giles in 2014.
the final third of his life. He is perhaps most remembered these days as Max the pathologist in early episodes of Inspector Morse, as Gollum in the 1981 radio version of The Lord of the Rings, and as Del Boy's father, Reg Trotter, in the 1983 Christmas Special Only Fools and Horses. But he had an illustrious early stage career, dropping out of Cambridge to play Estragon in the first UK performance of Becket's Waiting for Godot in 1955, and playing Aston in the first performance of Pinter's The Caretaker in 1960. He was later a member of the Royal Shakespeare Company, memorably playing Toad in the RSC's production of Toad of Toad Hall in January 1972, with Dame Judi Dench as Mama Rabbit! He was also in the cast of the play for which she won Best Actress in 1995, Absolute Hell at the National Theatre. Dame Judi and Peter were both born and educated in York where her father was Peter's family GP, and in her biography Peter is quoted as saying of their youth, "Hers was the best party I ever went to".